Is a golden generation for Irish athletics on the cards? If the Under-18 European Championships are anything to go by, there's a bright future for Ireland in athletics. The Irish delegation returned home from Gyor, Hungary with three gold medals and a silver. 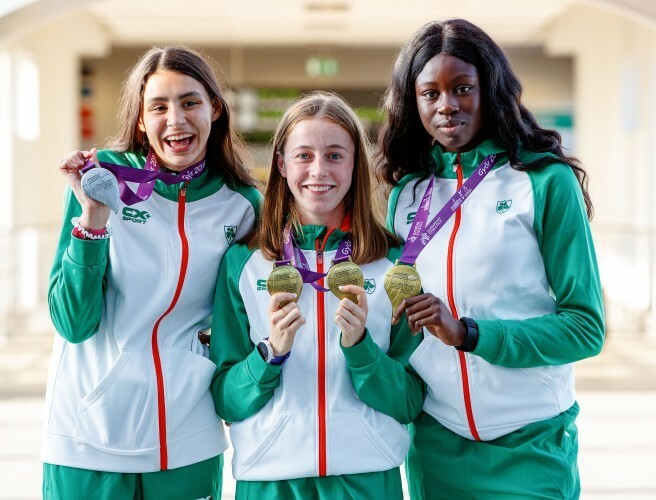 Sarah Healy won two golds in the 1,500 metres and the 3,000 metres, while Rhasidat Adeleke triumphed in the 200 metre final. Sophie O'Sullivan also won silver in the 800 metre with her mother, the legendary Sonia O'Sullivan presenting her with the medal. As Ireland basks in the glory of an unprecedented medal haul, journalist and OTB's Off The Bench podcast presenter Cliona Foley joined Joe Molloy to discuss the implications. "It's very important to say that that European Youth Championship competition, this is only the second time of it," Cliona explained. "These competitions didn't exist when Sonia was running. So you do have to put everything into context but it's been designed to help young athletes make the transition from Youth which is under-18 to Juniors which is under-20s. Then sometimes depending on their competition they can go to under-23s and then they go seniors. "The path from Youth to Seniors is laden with mines at every corner in track and field. It's such a difficult sport. "But you do have to look at this generation and also the interesting thing about them as well is sprinters. Whereas we had such a middle distance tradition for so long, it is interesting now that we are getting sprinters." Sarah Healy was already carrying strong form into the European competition as Cliona pointed out. "If anyone saw the Irish Indoors Seniors last year, she won the 3,000 metres senior and the way she blew away the field was unbelievable and her time last month, she ran 4:09 for 1,500 in Germany last month. That's the fastest time in the world for an under-18. That's how good she is at the moment. "And she's still in school and something I thought which was so encouraging was [the fact that] she plays hockey still and she isn't over-specialising in athletics." Overall, Cliona pointed out that the encouraging aspect is seeing young Irish athletes setting personal bests at that level of competition.